While in the branch of Lidl (or maybe Aldi - I always get them confused) I spotted some amusing imitation Oreos. Naturally I had to pick them up and got both flavours - only the creme filling varies. The first thing to note is the neat stacks of five you get individually sealed. This is only possible because their diameter is smaller than Oreos, but not so much that you feel cheated. This makes them much more snack friendly as they are less breakable in bags and pockets. The flavour of the biscuit is amazingly close, you'd be hard pressed to tell if this was crumbled up in a luxury desert instead of the real deal. The creme is maybe less strongly flavoured and the texture closer to that of a Bourbon or Custard Cream. Again this isn't an issue - it's still nice. 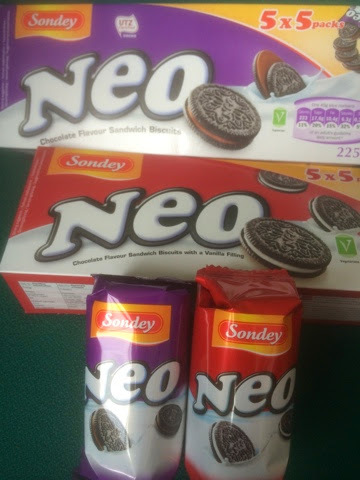 They aren't the cheapest biscuits in the store but still were around half of the price of a similar amount of Oreos, so you can eat more for your money.